​​PennDOT crews work day in and day out to keep our road and bridges safe for Pennsylvania residents and those who travel Pennsylvania roadways every day. But as motorists, it's also our job to keep those hard-working crew members safe so they can return home to their families every night. In 2016*, there were 2,075 work zone crashes in Pennsylvania. It's important to pay attention in a work zone, because just a moment of distraction can lead to very serious consequences and even to the loss of someone’s life. Motorists caught driving 11 miles per hour or more above the posted speed limit in an active work zone will automatically lose their license for 15 days. Not to mention, fines for certain traffic violations are doubled for active work zones. The law also provides for up to five years of additional jail time for individuals convicted of homicide by vehicle for a crash that occurred in an active work zone. Sadly, 87 PennDOT employees have lost their lives in the line of duty since 1970. To recognize those workers, PennDOT has a statewide memorial in downtown Harrisburg, as well as a traveling memorial based out of our Bradford County Maintenance Office. When driving through a work zone, the most impo​rtant thing you can do is SLOW DOWN and drive the posted work zone speed limit. STAY ALERT and pay close attention to signs and flaggers. And always AVOID DISTRACTIONS and give your full attention to the road. Check out the work zone safety section of our website for more important tips or to read stories about the scary close calls​ some of our employees have encountered. 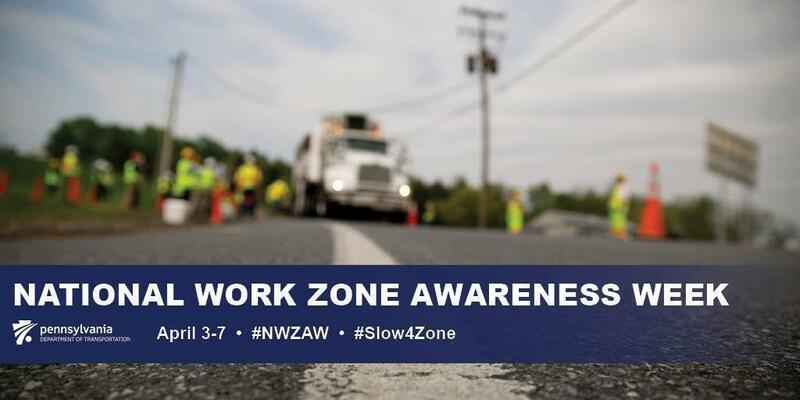 Share the work zone safety message on social media using the hashtags #Slow4Zone and #NWZAW. Follow PennDOT on Facebook, Twitter, and Instagram.